Kristine and Reinhardt find the body of a small boy, left in the woods, missing his red shorts. As they walked into the woods, they had met a man coming out, whom they start to suspect might have been the murderer. They call the police, and give them a description of the man and the car, but not enough for the police to find him. Two detectives Sejer and Skarre are in charge of the case. It's clear that the boy has been molested, but the cause of death is less clear. It's a difficult case to pursue but to begin with at least, they determine which paedophiles are in the area and whether any of them might have been involved. This turns out to be a dead end, but they have informative discussions with one of the paedophiles, that give some insight into what sort of man they might be looking for: a first timer, who might have finally decided to do something about his obsession, and may already be on the look out for another victim. In interleaved chapters however, we see the crime from the perpetrator's viewpoint, and while many of the assumptions about him may be right, it is clear that the murder may actually have been some sort of unfortunate accident. However he is very keen not to be caught, as he knows full well what will happen. The story also develops with the discussion of the discovery of the body by Kristine and Reinhardt. Kristine is shocked by the discovery, and even more shocked when she finds Reinhardt has taken pictures of the boy using his mobile phone, and is showing them to his colleagues. This drives her to reassess their already crumbling relationship, the childishness of Reinhardt, and her own frustrated desire to have a child of her own. This part of the story also provides an interesting window into the different reactions of people to a horrific crime. Another boy, Edwin then goes missing. He is a very overweight boy, about the same age as the first missing boy, but still attractive. Has the same man taken him? This is a very powerfully told story that touches upon various aspects of paedophilia, from the perspectives of the detectives, the perpetrator and others. It's a very sad story, one of loss of young children, loss of innocence, as well as depicting the diminished life of the perpetrator, who does feel ashamed of his crime, contrasted with the cruelty and lack of feeling from others. It is a beautifully written, yet taxing read, with a fresh take on this type of crime, that I thoroughly recommend. 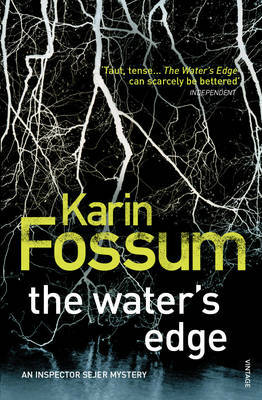 Read another review of THE WATER'S EDGE.